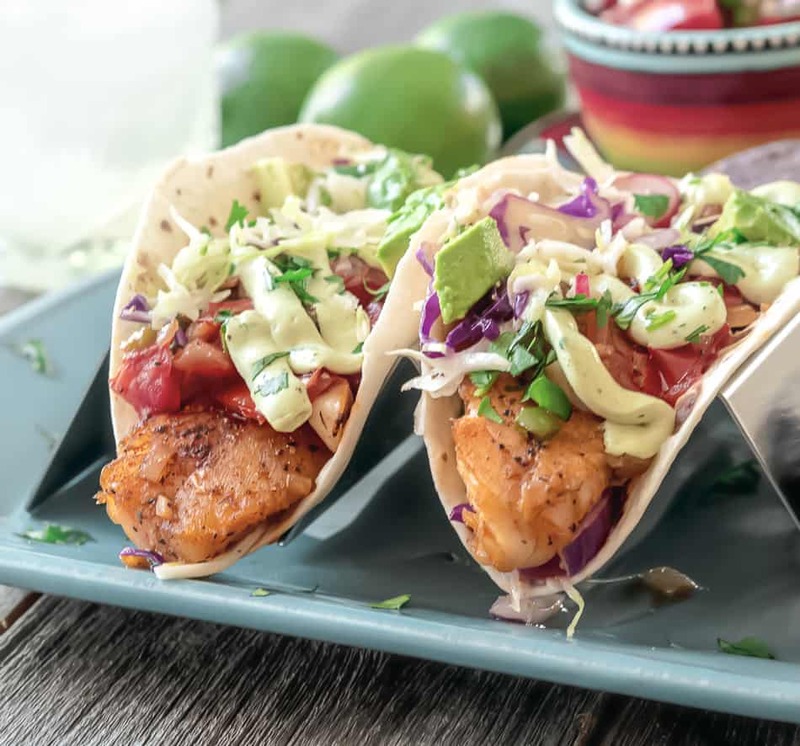 Warm Salsa Fish Tacos with Avocado Cream Sauce is a perfect way to jazz up the Lenten table or for my favorite, Taco Tuesday! As I mentioned last week, I belong to The Denver Bloggers Club. It’s a group where we share ideas about blogging and receive useful information from a monthly speaker. I met Teri Verbickis at one of these meetings. Food photographer extraordinaire, graphic designer (who updated my logo), photography teacher are just of few talents of this super creative woman. Teri is always looking for new ideas for her stock food photography that she sells to companies on her website Taking Stock Images. We decided to collaborate this week on my post. She could get images for her use and I could learn from a master photographer on how to set up and make my pictures more interesting. Well, I learned so much that my head hurts but I believe with her instruction this is my best picture to date! One thing that I am thrilled about and since my kitchen remodel, I have the perfect space for natural diffused light when I pull my bench to the middle of kitchen! Who would have ever thought about moving furniture to have a platform for perfect light? Teri, Teri did, and I am so grateful. It opens my time frame of not having shadows to a few hours which is great when cooking and designing the food! So I’m looking forward to expanding my photography knowledge and getting more interesting shots for my blog and cookbook! More to come on this one for sure. 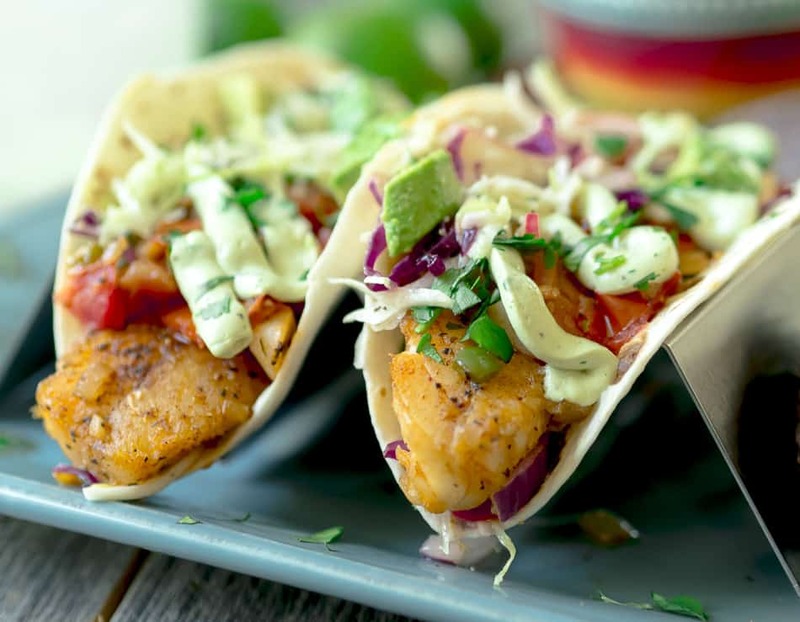 When deciding what to make this week, we both agreed that tacos were in order and since it’s the beginning of Lent, fish tacos should be on the menu. I wanted to change things up a bit and not make a fried or grilled fish taco. That’s to normal, and we all know I like thinking out of the box and normal is just, well, boring. Warm Salsa Fish Tacos with Avocado Cream Sauce, is my thinking out of the box creation. We all love a good salsa. Why not cook it with the fish? Turns out it’s tasty. 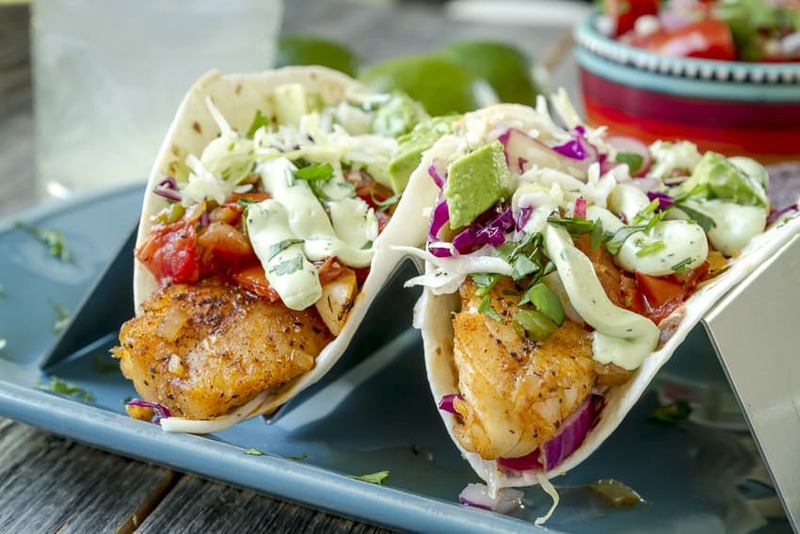 The fish takes on all the flavors of the salsa and the ancho chili adds a great smokey flavor to the whole dish while the avocado cream balances out the heat level from all the jalapenos! I lucked out on this one because it not only tasted great but is super pretty when it’s all put together! 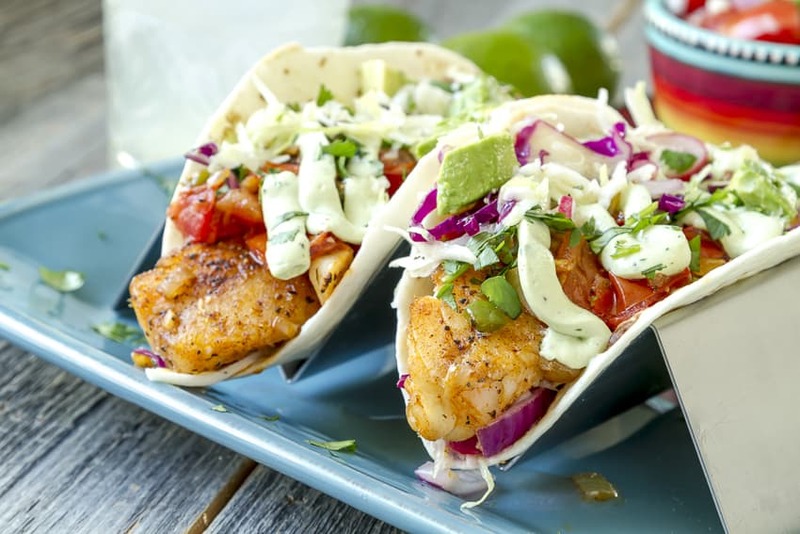 I hope you all try Warm Salsa Fish Tacos with Avocado Cream Sauce. It tastes great and happens to be pretty healthy to boot! Warm Salsa Fish Tacos with Avocado Cream Sauce are super flavorful as the fish is cooked in the salsa! Try it you'll like it! In a large saute pan heat up the olive oil over medium heat. Add the onions, jalapeno, garlic, salt, pepper and chili powder and cook until the onions become translucent, about 5 minutes. Pat the fish with a paper towel to remove any excess moisture and season with a pinch or two of salt and pepper and place in the pan. Cook the for about 3-4 minutes per side or until the fish is cooked trough. Add the tomatoes and the cilantro when you turn the fish over. To make the avocado cream. In a blender, add the avocado, Mexican crema, jalapeno, garlic, lime juice, cilantro, salt and pepper. Blend until smooth. To assemble the tacos. Fill the bottom or the tortilla with cabbage, radish, red onion, cilantro. Top with fish and the warm salsa and avocado cream. Add more vegetables and avocado slices if you would like. My friend Teri’s version of my Warm Salsa Fish Tacos with Avocado Cream Sauce! Dang she makes food look so good! Another one of Teri’s photos! She made it look so easy! Another picture of mine! Tasty tacos. I just like saying tasty tacos! Bravo Heather and Teri. You make a great team!! The tacos look outstanding!! Thanks Jenny! It was a fun day for sure!